Much of the World Percheron Congress will take place in the Richard O. Jacobson Exhibition Center located at the Iowa State Fairgrounds. This facility is part of a $20 million project that features covered access to the Horse Barn and complements the Fairgrounds’ current livestock facilities, including approximately 1800 stalls, a 19,000 square foot covered arena and the 47,000 square-foot climatized Livestock Pavilion. The new 110,000 square foot, state-of-the-art facility will accommodate up to 3,500 spectators in a naturally-lit, multipurpose venue. The Iowa State Fairgrounds consists of approximately 410 acres, 160 of which encompass a beautiful, wooded campground where camping sites are available. Listed on the National Register of Historic Places, many of the buildings on the grounds pre-date World War I! 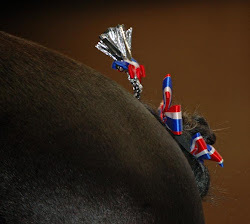 So, make plans today to attend the 2010 World Percheron Congress in Des Moines, Iowa!